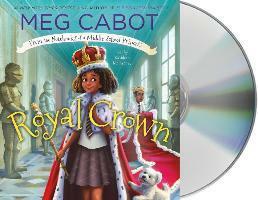 It's the first coronation of a female monarch of Genovia in 200 years, and Her Royal Highness, Princess Olivia Grace Clarisse Mignonette Harrison, is giving listeners the inside scoop in this newest audiobook from New York Times--bestselling author and illustrator Meg Cabot! Olivia Grace Clarisse Mignonette Harrison should be having fun. Her best friend is visiting from America, her sister's royal coronation is only three days away (the first coronation of a female ruler in two centuries), and she's even got a new boyfriend who is actually a very smart and charming prince! But it's hard to celebrate when her royal cousins are scheming to take over the throne. And with everyone running around, Olivia and her friends have been saddled with royal babysitting duties. Then, to make matters worse, Olivia's snobby cousin Luisa insists on gossiping about her, especially about things that should be personal . . . it's none of her business whether Prince Khalil and Olivia have kissed or not! When did growing up royal get so complicated?!? Meg Cabot is the #1 New York Times-bestselling author of the beloved and critically acclaimed Princess Diaries books, which were made into wildly popular Disney movies of the same name. There have been over 25 million copies of Meg's books for both adults and teens/tweens sold in 38 countries. Her last name rhymes with habit, as in "her books can be habit-forming." She currently lives in Key West, Florida, with her husband and various cats.